Edge computing is definitely a hot topic as we enter 2018. Are you already familiar with it? Wikipedia defines Edge Computing as "pushing the frontier of computing applications, data, and services away from centralized nodes to the logical extremes of a network." It enables analytics and data gathering to occur at the source of the data. This approach requires leveraging resources that may not be continuously connected to a network such as laptops, smartphones, tablets and sensors. To find out more about edge computing and how it ties into the various technologies covered by VMblog, I reached out to an industry expert, Hans O'Sullivan, the CEO of StorMagic. VMblog: It seems StorMagic is focused on storage for edge computing. What exactly do you mean by edge computing? Hans O'Sullivan: Edge computing is a relatively new term that serves as a catch-all for IT environments outside of large cloud deployments and datacenters. There is significantly more data being created and stored at the edge than there is in the datacenter. The edge requires lightweight, affordable IT infrastructure because complex datacenter designs are inappropriate where the number of locations can run into the hundreds, or even thousands. Examples of these types of environments include remote or branch offices (ROBO sites), small datacenters and IoT deployments where locations are often harsh and network connections limited. Organizations with edge computing requirements must ensure their infrastructure is super simple, reliable and easy to scale and grow because most edge sites lack on-site IT staff. 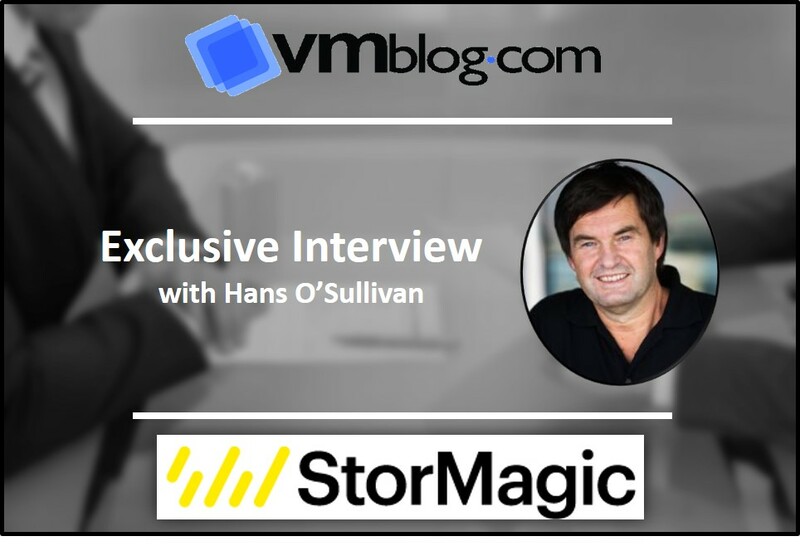 VMblog: And how does this apply to StorMagic and SvSAN? O'Sullivan: The beautiful thing about the move towards edge computing is that StorMagic SvSAN aligns perfectly with the demands set by these types of environments. As a lightweight, software-only solution, SvSAN sits on top of the hypervisor and virtualizes the underlying storage of any x86 server. Being a virtual SAN, it eliminates the need for a physical SAN without having to massively over-provision on hardware, thus delivering significant cost savings that, should a deployment involve multiple locations, are magnified many times over. It is reliable too - high availability is delivered through the synchronous mirroring between the two nodes at each location. VMblog: Storage architects might argue that there are many other providers within this space capable of doing what you describe. Why is SvSAN different to other solutions? O'Sullivan: From our perspective, competing solutions in this space all share a common problem - they were designed initially for the datacenter and have been ‘slimmed down' to try and make them suitable for edge sites. Conversely, SvSAN has been designed from the outset specifically for edge computing environments. As a result, the solution isn't compromised by overly-complex requirements and can be deployed, managed and scaled very easily. Using any combination of hard disks and SSDs within the server brand of their choice, the storage architect can configure an optimized, lightweight solution with SvSAN that requires just two nodes per site. In addition to a remote witness that can manage thousands of sites from a single virtual machine running at any location, SvSAN needs significantly less server and storage hardware than others in this space. VMblog: Are there any particular applications where you see a product like SvSAN being a major benefit at edge sites? O'Sullivan: SvSAN hasn't been designed with one specific use-case or vertical in mind. Current deployments range from oil rigs and very remote wind farms, to hotel resorts, bank branches, IoT deployments and manufacturing plants. Nevertheless, we have seen particular success within the retail sector where SvSAN has proven to be ideal for the requirements typically found in distributed retail branch locations. For larger regional and national retail chains with hundreds and sometimes thousands of stores, the IT infrastructure deployed at each site must be as cost effective as possible without compromising on performance. SvSAN's minimal hardware requirements, high availability and low cost have made it a perfect fit. Elsewhere, we are also seeing a growing demand within end-user computing and have partnered with Citrix to offer the Citrix Ready HCI Workspace Appliance. This allows engineers to spin up server and desktop resources from the XenApp and XenDesktop Service to on-premises resource locations. With edge computing heralding a rise in the demand for these applications in branch and remote locations, SvSAN is well placed with its low requirements to provide an optimal solution. VMblog: How about telling us about a customer example? O'Sullivan: A great example of an edge computing solution that is leveraging SvSAN is Harris Corporation. They have a 911 communications solution that is used by police departments and municipalities throughout the U.S. Two key requirements for these deployments is performance and cost. Because of our Predictive Storage Caching feature where we automatically move data between different caching media (spinning disk, SSD and system memory) based on its frequency of use, these voice processing systems are able to deliver the required performance without requiring all-flash arrays or other expensive server hardware. VMblog: Where does StorMagic go next? O'Sullivan: At the present time SvSAN supports both VMware vSphere and Microsoft Hyper-V hypervisors. While these are generally the most popular, particularly vSphere, we are seeing a growing demand to support KVM because of the much lower price points. As I've mentioned, low-cost is a key requirement at the edge and many of our larger customers are interested in significantly lowering the "hypervisor tax". Consequently, our engineering team is working on supporting the KVM hypervisor in the future. With the ability to deploy on any x86 hardware and an expanded offering of three supported hypervisors, SvSAN users will enjoy even greater flexibility in their deployment options.